I’ve been engaged in several data modernization discussions lately with various organizations, and there seems to be a theme emerging that points to two very different and diverging approaches to data modernization: one that is very thought-out, proactive, future-oriented and is likely to unlock the promise of data modernization and the other which is very reactive, tethered to the past and likely to lead to inevitable and expensive course corrections. Two of these discussions occurred on the exact same day with two different companies, only hours apart, so my team and I were given an opportunity to closely examine these two very different approaches in a relatively short period of time. As I drove back to my office that afternoon the Charles Dickens novel, A Tale of Two Cities suddenly popped in my head. Below I will describe the current state at each of these two companies and their current plans to modernize their data operations and infrastructure. My hope is that the differences will be clear and the advantages of one versus the other will be easy to discern. Similar to the dichotomy that Mr. Dickens eludes to in the opening lines of his book, I see companies going down one of two paths as it pertains to data modernization. Company A (Reactive) – Ignore people, processes & governance and simply spend money on new data tools and architecture and hope for the best. Company B (Proactive) - Realize that data isn’t an IT challenge, but rather a business and organizational challenge. In addition to the right data technology, getting people, processes and governance up to speed is not only critical, but necessary in helping to inform any technology developments and in providing a proper foundation to build on. Company A is a medium-sized organization that as a matter of function, provides data in various forms to its customers. All revenue streams are in one way or another reliant on the data that is collected, disseminated and made available to paying customers. Customers include both individuals and other companies. As with many organizations, there is no official data governance in place, data is very siloed and disconnected, and there are several different people and teams collecting, storing and using data in different ways. During our meeting, it was brought to our attention that this organization recently realized the severity of their data challenges and immediately embarked on a plan to create a new data lake and purchase a new master data management tool. We advised against investing too quickly in any expensive tools or architecture until, at a minimum, there was at least a plan in place to deal with the underlying challenges related to people, process and governance. We were told that leadership insisted on the tool and architecture and believed that by virtue of the fact that all data moving forward would be located in one central location and be accessible by anyone who may need it, that many of the existing data challenges would eventually be mitigated. That afternoon we met with a few leaders at a different company. Company B is a very large organization that serves the consumer market. While this company’s revenue isn’t directly tied to the data that they collect, like many consumer-facing companies they rely on the business intelligence contained within their data to provide insights into the customer experience desired by their market. In turn this allows them to respond to customer demands better and faster than their competition – a significant market advantage. A few years back they too realized they had to modernize their data operations. Unlike Company A, however, they fortunately realized that this was a challenge that would require modernization beyond simply buying a shiny new piece of technology or software. 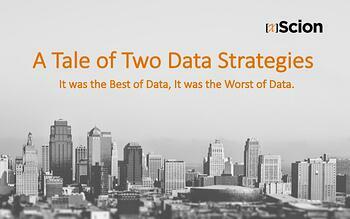 They started by looking at the people in the organization who handled data. They soon realized that a cross-section of data handlers revealed a diverse group of people, all with different job responsibilities and levels of seniority. With that in mind, they created a group of stakeholders or a data council as it’s often referred to, who would drive data maturity moving forward. With the data council in place, they were able to tackle data governance and create a common language, best practices and rules around how data was to be collected and stored. It also created transparency between leadership and practitioners. Eventually, this company was able to use all of this internal intelligence about how data should flow and how it should be handled, to inform decisions about data tools and architecture. Ultimately, they too built out a data lake, but the data going into the lake was now all in the same format and syntax. They created a few new data leadership roles so there were now people who owned data maturity moving forward. These people would also help to enforce both the flow of data into and out of the new data lake, as well the data governance that was created and implemented collectively from the cross-functional data council. A new BI and analytics tool was implemented and integrated into the data lake and made accessible to anyone who might need access to certain data sets. Depending on the department or role, rules around that data flow were put in place. Moving forward, as more departments need access to certain data, that process will be very straight forward and scalable. While these two meetings happened to occur on the same day, these tend to be the two most common stories we hear at all of the organizations we engage with around data maturity. For those who jump too quickly to the expensive tool or infrastructure investments, more often than not we’re called in after the fact to fix the people, processes and governance. The fact of the matter is, data maturity occurs on a spectrum and no organization will ever be exactly where they want to be in terms of their data operations. But, you need to have visibility into where you might be with regards to that spectrum and into where you need to first invest time and money to ensure you’re managing data modernization in the most cost-effective and efficient way possible. We help our clients to gain that visibility through our Agile Data Maturity Model or ADMM, as we call it. This whole concept of taking two different paths to data maturity brought to mind another famous piece of literary work. “Two roads diverged in a yellow wood, and sorry I could not travel both… I took the one less traveled by, and that has made all the difference.” These are the first and last lines in Robert Frost’s famous poem, The Road Not Taken. In the years ahead, the companies that master their data will also be the ones who master their markets and eventually the economy as a whole. The decisions that a company makes today around data modernization will therefore be critical to the timing of this data mastery. Will you be a leader or a laggard? Will you take the familiar path, or the road less traveled? And finally, what tale will you be telling about your organization one day? The choice is yours.